Tired of people who leave negative comments on your social media page? On social media, trolls are everywhere, and it’s almost impossible to dodge them. Trolls can cause a lot of damage to your brand if not dealt with in the right way. What “the right way” is, and how you should respond to them to minimize damage is exactly what you’ll learn in this article. 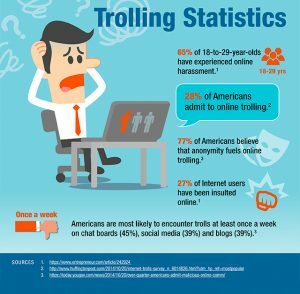 What are social media trolls? As usual, Wikipedia’s definition is kind of disappointing. Mostly because it’s a bit incomprehensible and doesn’t give us the full story. Therefore, I’ll try my best to give a clear and straight-forward explanation of the word. 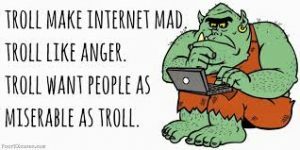 Trolls can be found on the internet and are individuals who intentionally stir up communities in the hopes of a reaction. They are often sharing hate-filled messages and are often very persistent. Some trolls can clench onto you like termites and if you don’t deal with them, they can stay there forever. What defines trolls by nature is that they spread negativity and complain without any relevant grounds. It doesn’t have to be more complicated than that! Trolls are not only found on social media but everywhere on the internet. In chat groups, In comment sections, on forums etc. As a brand, it is crucial that you know how to deal with trolls so that they don’t end up harming your brand and makes it look like you are the one who is wrong. Moreover, what is also dangerous is that trolls that don’t feel like they’re getting the attention they are hoping for. Note that just because someone disagrees with you or complains about your brand doesn’t make them trolls. People can dislike or disagree with your brand and not be a troll. Some people think that in order to be classified as a troll, you need to use a fake name and comment negatively on every post someone share, but this is debatable and I don’t completely agree with that. I believe that if a person is expressing their disagreement/dislike in a way that is intentionally harmful, mean, or threatening, or in any other way makes the community an unsafe place for others, that’s when we’re entering troll territory. A common question that is frequently being asked is if you should ignore trolls. I’ve seen mixed opinions on this so I thought I’d give you the ultimate answer once and for all. Some claim that ignoring trolls is the best way to deal with them because if you do, eventually they’ll get bored and go somewhere else. Others say that ignoring them only makes them angrier and more aggressive and provocative. When you don’t respond, it makes them more superior as it gives them the power to silence you. Essentially, it shows the troll that they won, even though that isn’t the case. You might believe that when you ignore the trolls, eventually they’ll get bored, but that isn’t necessarily the case. Yes, that might happen, but what’s surprising about trolls is that they are extremely patient, and it can take a long time before they stop. By the time that happens, they will have caused a lot of damage to your brand – damage that could have been prevented if you’d just dealt with them in a better way. When you have people who are trolling on social media, you should avoid feeding them at all cost. When feeding the trolls, you’ll only make them angrier and more active on your page. To avoid feeding them, you should avoid responding in a manner that stoops to the troll’s level. If you do this, you risk two outcomes. First, you risk feeding the trolls and getting into an engaging and unwinnable argument that will escalate. Second, you risk making your audience see you in a bad light. (More on that in point 5). Humour is one of the most effective ways to deal with rolls, but it is also one of the most dangerous. 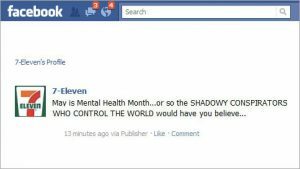 If used correctly, you can disarm the trolls and shoo them away from your page so they never return. However, if you do it the wrong way, you risk making the troll even angrier, and potentially help make the trolls start a riot and get more people involved. In order to use humor successfully when disarming trolls, you should know your audience very well, and your audience should know you very well as well. You’ll best succeed with humor if you have a clear brand personality that is fun and humoristic. If you are known to be boring and conservative, people will have a hard time resonating with your humor because they don’t expect it from you. Moreover, they might misinterpret it because they’re not used to humor from you, thus making them even angrier. Because one misunderstanding could cause many negative reactions which could spread through internet very quickly. 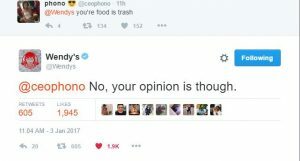 The most well-known example of a brand that uses humor on social media is Wendy’s. They are notoriously known to have a sassy and fun personality, and as a result, people expect jokes from them. That’s also part f the reason why it works so well for them. 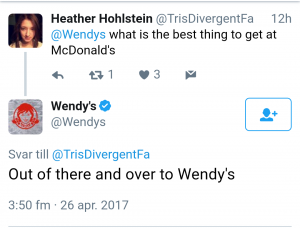 What’s important to remember is that Wendy’s personality on social media would definitely not work for everyone. Lastly, if you are notoriously known to be a “boring company”, there’s also a risk that you simply won’t come up with great jokes and humoristic ways to respond to the trolls. There’s a fine line between being funny and being a negative troll, and it is crucial that you don’t pass the line. If you use humor correctly though, your answers can go viral and bring in more fans and followers, while also disarming your opponent and embarrassing them in front of your whole audience. willing to take. If you know that humor will work well, then I encourage you to go out and win over the trolls with the help of it! However, when using it, you need to use it carefully and avoid coming off as sarcastic or mean at all cost, but when you use it correctly, it can help you make the most out of a bad situation. You don’t always have to deal with trolls out in the open for everyone to see. Another way to deal with the trolls on social media is to address their message privately. This may or may not work considering the fact that trolls often want the most attention they can get, and dealing with them in private removes that. Addressing in private allows you to talk to the troll on a personal level and to see where they’re coming from, and to let them know where you’re coming from too. Sometimes, doing this can convert an angry and negative into a loyal supporter, but there’s no guarantee. Once you’ve handled the issue privately, it is appropriate that you reply to the message and thank them for chatting with you in private. This will show your audience that you’ve addressed the issue and dealt with it. It will also show your audience that you are mature and professional in handling negative feedback such as trolling. What speaks louder than just words? If trolls want to hurt you, there’s a risk that they are going around and spreading false information and inaccuracies about your brand. The best way to deal with this is to prove them wrong with facts. This way, you pull the rug under their feet and shatter their credibility. If there really is an issue, you’ll be best off by addressing it and showing that you are doing everything you can to solve it, but again, if someone is just pointing out flaws about your brand, they might not be trolls who want to damage your reputation. They might just be disgruntled, disappointed customers. When you address a problem early on, you can stop any controversy from spreading. When you have people trolling your brand, there’s a risk that you’ll end up as a troll yourself. I touched upon this briefly in the beginning of this article, but let’s get into it more thoroughly. As I mentioned earlier, when you are trying to deal with trolls with humor, there’s a risk that you might just end up portraying yourself as a troll yourself. I mentioned this earlier, but I cannot emphasize this enough. It’s important that you learn to separate disgruntled customers from trolls. Just because someone says something negative about your brand doesn’t mean they are trolls. If you learn to listen to what they are actually saying, you might actually be able to extract some valuable information on how you can improve as a company. Sometimes people just want to be heard and if you hear them out, you might just realize that they have no intention in harming your brand, but instead want the best for your brand and want to help you improve. This is something you should stay away from most of the time, but sometimes, it might be necessary. If the troll doesn’t stop even if you’ve used several of the listed methods, and they’re seriously harming your brand and spreading negativity, a block might be a good idea. A time when you should definitely block a troll is when their negativity starts turning into threats or hate speech. If this takes place on your page, you should block them immediately, but also remember that they can easily create new accounts, so, therefore, it’s important that you stay on guard. When you establish a brand personality that is kind and genuine, you show the people around you that that is the way you want your community to look like. In other words, you influence your audience by simply establishing your own personality and make it clear what personality you have. No matter what type of personality you have, you should always treat your audience kindly. Trolls are normally hoping for you to react, but if you show that you aren’t really affected by them, they’ll eventually get tired and move on. When you take an active part in your community, you build strong relationships with the people in your audience. When you do, some people will actually come to rescue and protect you when trolls are trying to pick a fight. Moreover, when taking an active part in your community, you can follow the discussions that are taking place on your social media channels closely. If a troll comes in, you can quickly identify the problem and address the issue quickly with the methods listed above. Set rules and limits to what you allow on your social media pages. If you see that trolls are definitely crossing your line, you can hop into the discussion and let them know that you don’t accept that kind of behavior on your page. If they continue, choose one of the methods above accordingly. Where will you draw the line? Will you accept threats? Will you accept abusive language? When you’ve set rules, let your community know what your rules are and what happens when they cross them. Trolls are and can be, extremely harmful to social media. With one main goal of harming and creating chaos, there’s no good reason to let them stick around. Trolls can harm your brand and image, and that’s also why it is crucial that you have a plan in place on how you’re going to deal with them when they come to you. Deal with them the wrong way and you’ll end up creating even more threatening trolls. Succeed in interacting with them, and you might just be able to convert them into loyal followers. It all depends on your power of speech.